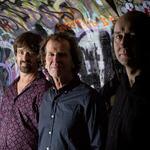 The Alister Spence Trio is one of the most distinctive and spellbinding units in Australian improvised music. They have gained worldwide recognition for their ingenious compositions and magnetic, energised, live interplay. Together they create luminous soundscapes that are dark, lyrical, textured and endlessly surprising. The trio have released seven CDs, with an eighth CD, featuring Australian rock guitarist, Ed Kuepper, scheduled for release at the end of 2019. Not Everything but Enough (2017, ASM005) was voted in the 2017 top 10 jazz releases worldwide by Music magazine, Japan, and listed in ‘Honorary mention Best of 2017’ in New York City Jazz Record magazine. Alister Spence Trio: Live (2015 ASM004) received 4 stars in Jazzwise Magazine (UK). Far Flung (Nov 2012) was listed in the Critics Poll in Jazz Journal (UK), Best of 2013.